So which is the best 65″ 4K Ultra HD TV? A question often asked is 'Which is the best TV on the market?'. A tricky one to answer, thanks to the wealth of proprietary technology available from the various main screen manufacturers. It is also rare to see all contenders running together unless in a retail store with questionable input source or set up. 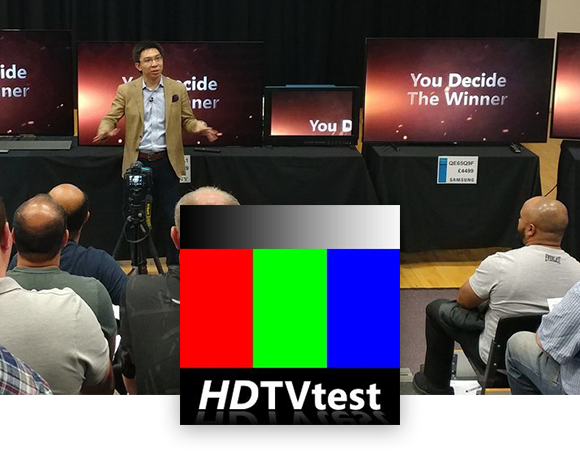 One way of ensuring an unbiased opinion is when the public choose a winner, which is why, in 2013, HDTVTest set out to offer the public a chance to vote on the best TV by creating the HDTVTest Shootout. So that all of the displays can be fairly judged, they require a simultaneous input, which is where we come in. Having tried many HDMI distribution amplifiers, HDTVTest settled on the CYP QU-10-4K22 and QU-4-4K22, as they were proven to be the most reliable and accurate HDMI distribution amplifiers they could find. As this is a totally independent test, we are delighted to have been asked to support this event and it is testament to our product development and signal distribution integrity. Watch this space to discover the winning screen, as we will be reporting back next week.